What sort of man will you be? A hallmark of Northern Frontier is developing mature, male, Christian leaders. In recent years, we have noted a decline in two development areas: a man's character and traditional male skills. Toolbox addresses both. Two mature, Christian men - professionals in general maintenance - will not only show you, but let you try your hand at the basics of electrical work, plumbing, auto maintenance, carpentry, welding and more. Your Bible Exploration times will focus on the character qualities of a man: Integrity, Courage, Conviction, Competence, Faithfulness and Passion to name just a few. You'll enjoy Northern Frontier's waterfront each day, attend Battalion campfires and play Battalion games, but your focus for the week will be on who a man is, and what a man does. The one-week program is limited to 8 campers - ages 13 through 15. You will bunk together in the same cabin. 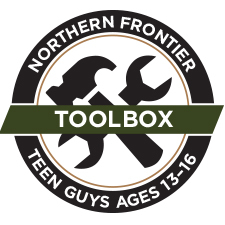 Toolbox is for young men who want to learn trade skills and be equipped with the right set of “life tools” to become a man of God. In a very few years, you are going to be a man. Who will you be? What will you be able to do? Toolbox is designed to help root you in God’s Word.